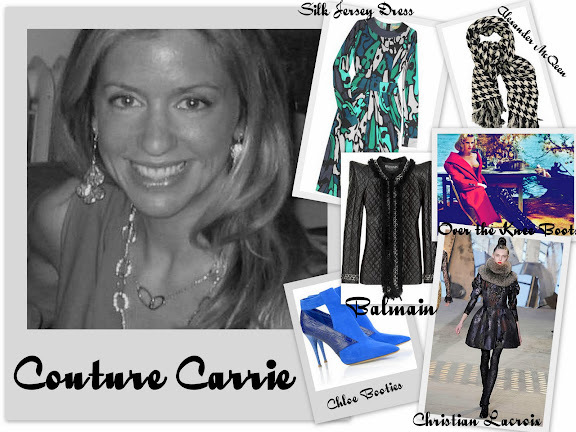 I am still new to the blogging world and a few weeks ago I came across Carrie Critton's blog, Couture Carrie. I immediately was hooked on Carrie's unique style. For every post she picks a theme ( e.g. "Mad Men Mania" or "Platforma") and gives her readers a plethora of images that she is inspired by. Carrie has a great eye and a sweet personality too! I recently asked Carrie some questions about her blog and her style. 1. What inspired you to start a fashion blog? Ever since I was a teenager and fell in love with fashion, I have maintained a fashion journal/sketchbook charting prevailing trends and my own clothing and accessories purchases. About a year and a half ago, I decided it was time to try a new medium, and Couture Carrie was born! 2. Who is your favorite couture designer? Christian Lacroix, for his whimsy and attention to detail. 3. Are you a bag or shoe kind of girl? Both! But I must admit, I have far more shoes than bags. Here’s a recent purchase: Chloé blue suede cutout hidden platform booties. 4. How would you describe your personal style? Edgy yet sophisticated. I pride myself on mixing Designer pieces like this Issa dress (silk jersey dress in main image) with low-end items from Target, etc. 5. What do you enjoy doing when you aren't blogging? I am a Pilates instructor, so you can often find me at Big Sky Fitness Center or the Hartford Golf Club. Also, love to go out for cocktails with my gal pals or watch Mad Men while flipping through my favorite magazines. 6. What are 3 fall trends you are craving to try? Over –the-knee boots, a peak-shouldered jacket, and something Houndstooth. Thank you so much for a wonderful feature, darling! Fabulous-wonderful learning more about my favorite fashion blogger. I love CC! She's spot on and has such a big heart to top it off. She is a great blogger and popular!